Nikola Tesla, whose name Elon Musk chose for his electric car company, was on the cover of Time magazine in 1931 for his achievements. Unfortunately, he died a poor man in 1943 after years devoted to projects that did not receive adequate financing. Although the main Tesla lab building on Long Island, New York is being restored by a nonprofit foundation — the Tesla Science Center at Wardenclyffe — the World System broadcast tower he built there was torn down for scrap to pay his hotel bill at the Waldorf Astoria in 1917. Yet Tesla’s most significant inventions resonate today. Tesla’s ambitions outstripped his financing. He didn’t focus on radio as a stand-alone technology. Instead, he conceived of entire wireless transmission systems, even if they were decades ahead of the time and not financially feasible. 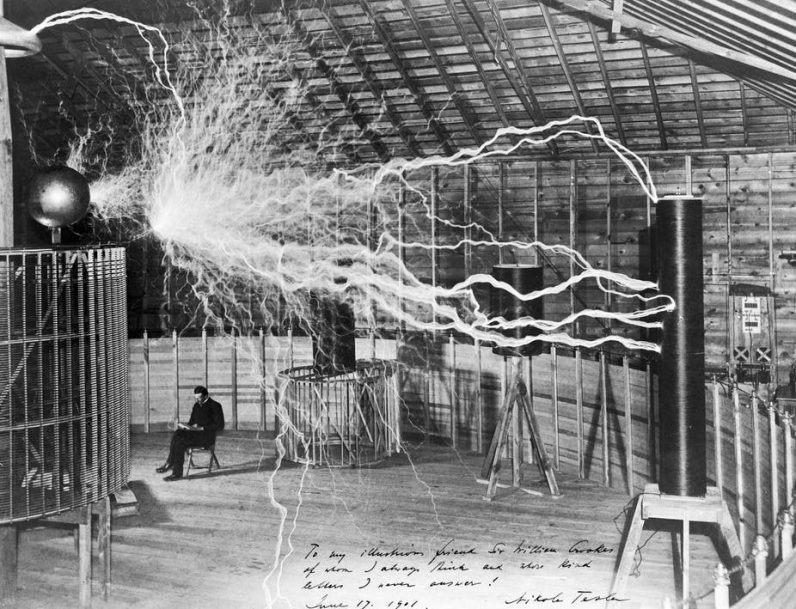 Tesla envisioned a system that could transmit not only radio but also electricity across the globe. After successful experiments in Colorado Springs in 1899, Tesla began building what he called a global “World System” near Shoreham on Long Island, hoping to power vehicles, boats and aircraft wirelessly. Ultimately, he expected that anything that needed electricity would get it from the air much as we receive transmitted data, sound and images on smartphones. But he ran out of money, and J. P. Morgan Jr., who had provided financing, turned off the spigot. Tesla’s wireless house lighting scheme was the first step towards a practical wireless transmission of energy system. The most striking result obtained was two vacuum tubes lighted in an alternating electrostatic field while held in the hand of the experimenter. 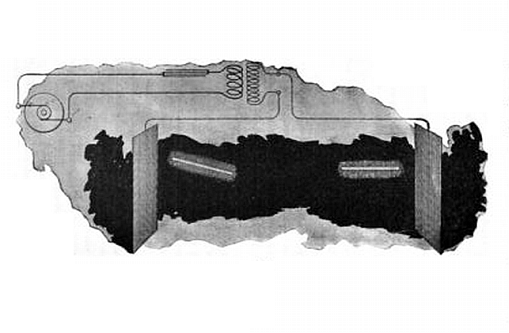 The wireless energy transmission effect involved the creation of an electric field between two metal plates, each being connected to one terminal of the induction coil’s secondary winding. A light-producing device was used as a means of detecting the presence of the transmitted energy. Two high voltage AC plates fill the room with a fairly uniform electric field. The bulbs are vertically oriented to align with the electric field. 1. By using two type-one sources positioned at distant points on the earth’s surface, it is possible to induce a flow of electrical current between them. Tesla also made an assumption that Earth is a charged body floating in space. Tesla was familiar with demonstrations that involved the charging of Leiden jar capacitors and isolated metal spheres with electrostatic influence machines. By bringing these elements into close proximity with each other, and also by making direct contact followed by their separation the charge can be manipulated. He surely had this in mind in the creation of his mental image, not being able to know that the model of Earth’s origin was inaccurate. The presently accepted model of planetary origin is one of accretion and collision. We now know that the earth is, in fact, a charged body, made so by processes—at least in part—related to an interaction of the continuous stream of charged particles called the solar wind that flows outward from the center of our solar system and Earth’s magnetosphere. “But the upper strata of the air are conducting, and so, perhaps, is the medium in free space beyond the atmosphere, and these may contain an opposite charge. Then the capacity might be incomparably greater”. We also know one of the upper strata of Earth’s atmosphere, the ionosphere, is conducting. “In any case it is of the greatest importance to get an idea of what quantity of electricity the earth contains”. An additional condition of which we are now aware is that the earth possesses a naturally existing negative charge with respect to the conducting region of the atmosphere beginning at an elevation of about 50 Km. The potential difference between the earth and this region is on the order of 400,000 volts. Near the earth’s surface there is a ubiquitous downward directed E-field of about 100 V/m. Tesla referred to this charge as the “electric niveau” or electric level (As noted by James Corum, et al in the paper “Concerning Cavity Q,” PROCEEDINGS OF THE 1988 INTERNATIONAL TESLA SYMPOSIUM, and others). “It is difficult to say whether we shall ever acquire this necessary knowledge, but there is hope that we may, and that is, by means of electrical resonance. If ever we can ascertain at what period the earth’s charge, when disturbed, oscillates with respect to an oppositely electrified system or known circuit, we shall know a fact possibly of the greatest importance to the welfare of the human race. I propose to seek for the period by means of an electrical oscillator, or a source of alternating electric currents”. Another Tesla invention combined radio with a remote-control device. We’d now call it a robotic drone. Shortly after filing a patent application in 1897 for radio circuitry, Tesla built and demonstrated a wireless, robotic boat at the old Madison Square Garden in 1898 and, again, in Chicago at the Auditorium Theater the next year. These were the first public demonstrations of a remote-controlled drone. An innovation in the boat’s circuitry — his “logic gate” — became an essential steppingstone to semiconductors. Tesla’s tub-shaped, radio-controlled craft heralded the birth of what he called a “teleautomaton”; later, the world would settle on the word robot. We can see his influence in devices ranging from “smart” speakers like Amazon’s Echo to missile-firing drone aircraft. Tesla’s achievements were awesome but incomplete. He created the A.C. energy system and the basics of radio communication and robotics but wasn’t able to bring them all to fruition. His life shows that even for a brilliant inventor, innovation doesn’t happen in a vacuum. It requires a broad spectrum of talents, skills and lots of investment capital.